Sublimated patches can be a great option for many decorators. This type of patch is able to support full color designs, even those with gradients and fades. Sublimated patches are a perfect option when wishing to add a photo to an item. Tiny details that may not be easily duplicated in other decoration disciplines will often easily be handled by a sublimated patch. Sublimating a patch also ensures that the color will last as long as the patch does, since sublimation ink actually dyes the fabric to which it is transferred. Clearly, there are a lot of advantages that a sublimated patch can offer, and one big decision that needs to occur, how will your sublimated patches be made. There are two options for creating sublimated patches, buy them already made from a supplier, like EnMart, or buy or make blank patches of your own and then sublimate those. Both options have pluses and minuses. When you buy an already sublimated patch, it comes to you completely done. All you have to do is put it on whatever item has been chosen for decoration. So there’s not a lot of time involved, other than the time to create the art, place the order and then add the patches to the item in question when they’re received. Artwork, at least when ordering sublimated patches from EnMart can be fairly simple too. While we prefer and request vector artwork, we can work with something as simple as a .jpg. One potential drawback of ordering premade patches may be minimum requirements. At EnMart the minimum is 25 pieces per design, size and color combination. If you’re doing a small job, that may be more than you need or want to order. Price can also be an issue when purchasing sublimated patches. If you have sublimation capabilities, you may have to crunch the numbers to see if making your own patches is more cost effective than purchasing them already made and sublimated. The other option for creating a sublimated patch is making your own, and there are two ways of doing this. One is to buy blank patches already made, and add a sublimated design to them. The other is to make your own patches from scratch either with a sublimated fabric or choosing to sublimate the patches after they’ve been constructed. There are costs and benefits for both methods. If you choose to buy a blank patch, you will have less of a minimum than you would if you were purchasing a sublimated patch, assuming you made your purchase from EnMart. Our blank patch minimum is 10 pieces per size and color combination. The time invested in production would also be shorter, as you would only have to print your design and then press it on the patch. One issue with this method is the fact that designs that go all the way to the edge of the patch would probably not work too well. Another is the need to purchase extra patches in case you make a mistake. On the other side of the coin is making your own sublimated patches from scratch. Here you would need to cut the patch, create some sort of border, and also create the sublimated design and add it to the fabric. This would most likely consume the most production time. It is also a method that may result in something that looks the least like a professionally merrowed patch, although that may not matter. The plus side of this method is that you can make as few or as many patches as you need. Keep in mind, for either of these options, you would also need to have a sublimation printer and inks and paper in order to create a sublimation transfer. That is a cost that needs to be included when calculating what method is the most fiscally sensible for your business. 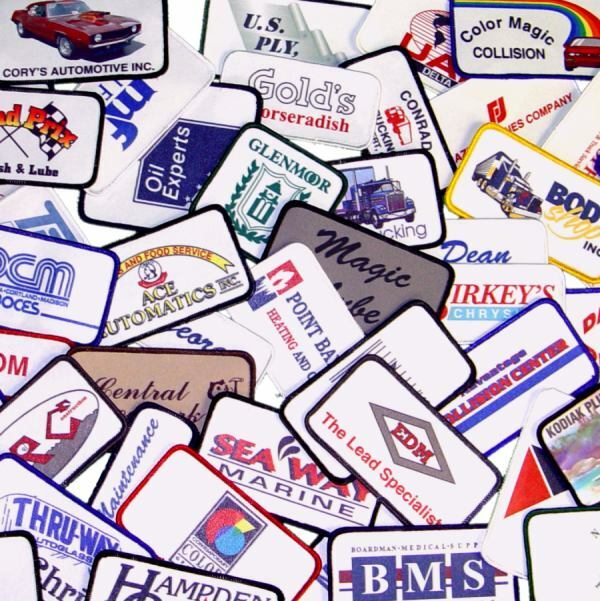 Creating your own patches may seem to cost less, but has hidden costs in supplies and labor. Ultimately the best method for creating sublimated patches is the one that makes the most sense for you. If you’re working with large volumes and often repeat designs, than having someone else produce the patches may make the most sense. If you’re working with short runs of a few pieces, and only need sublimated patches on an irregular basis, then making your own could be the best option. Remember, the best option is the one that makes the most sense for you and your business.